The Tester and TestFilter are the two key transformers for conditional filtering. They are for tests on attribute values. Has there been more than six inches of snowfall? Is this a major road? Is the temperature less than zero degrees Celsius? Was sand last applied more than 24 hours ago? Here, features will pass if the value of their Snowfall attribute is greater than six. If it is less than (or equal to) six, the feature will fail the test. Has there been more than six inches of snowfall AND is the temperature less than zero degrees Celsius? Is this a major road AND (has there been more than six inches of snow OR (is the temperature less than zero AND was sand last applied more than 24 hours ago))? When I have multiple tests I control them using the Pass Criteria field. A mix of AND/OR clauses requires a Composite Test, as shown above. But - however complex the test becomes - it still results in a single Yes/No result; features will either pass or fail this set of tests. Notice we aren&apos;t restricted to simple tests of equality (A=B); in the above there are also "greater than" and "less than" tests. That&apos;s because there are many different operations available for use in a test clause. 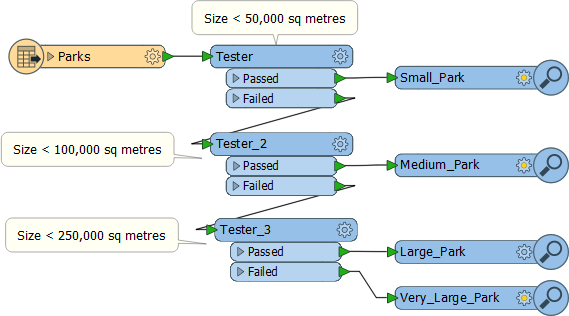 "Attribute has a value" is a new test for FME2016. It is basically the opposite of the three other tests; i.e. this attribute is not Null, AND it is not an empty string, AND it is not missing. Any existing Testers (i.e. added to a workspace in 2016.0) will act the same as before, but newly added Testers will exhibit the new behaviour. The TestFilter (#11 in the top 25) is essentially a way to combine multiple Tester transformers into one. Instead of the Tester&apos;s single Passed and Failed ports, you can create an output port for each condition (it does not need to be called "Passed") and an output port for features that fail all of the test conditions. The TestFilter is very similar to the CASE or SWITCH command in programming or scripting languages. - Has there been more than six inches of snowfall? - Has there been more than four inches of snowfall AND is this a major road? - Is the temperature less than zero degrees Celsius AND was sand last applied more than 24 hours ago? It’s a set of cascading tests, because if there has been more than six inches of snow, the ploughs are sent out anyway; you don’t need to test any other criteria. So the test order can be very important. Also notice that you can include composite tests (those with ANDs or ORs in them). 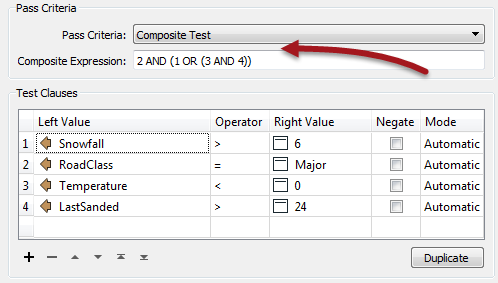 The TestFilter has the full set of operators available with the Tester such as equals, greater than, less than, and so forth. Each condition is tested in turn. Features that pass are output through the matching output port. Features that fail are sent on to the next condition in the list. Therefore it’s very important to get the conditions in the correct order. 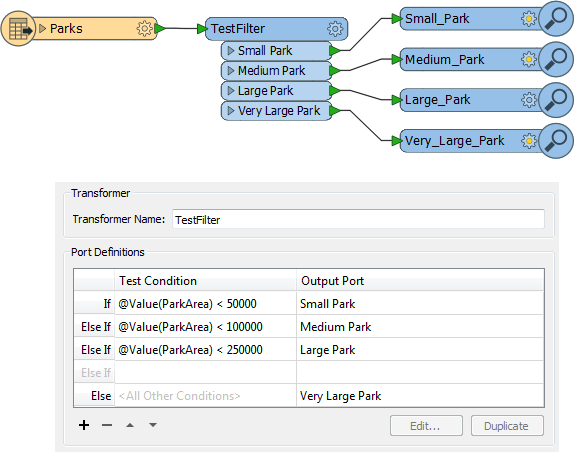 In this example the user has used three Tester transformers (and six connections) to filter out the different parts of this data. With the TestFilter, the three Testers are now replaced with one single transformer and there are only four connections. Also notice how the TestFilter output ports have custom naming. This is another advantage to this transformer. Because the TestFilter can carry out a single test (as well as multiple ones) it&apos;s possible to use it exclusively instead of the Tester transformer.